Greek Tacos? Is that possible? Is that against the rules? Who ever heard of that and what exactly is it? Yes, let’s hope so, no (What rules? There are no rules! ), and keep reading! I certainly never heard of Greek Taco Bowls before so I have created them right here. My son and daughter-in-law sent me a Christmas gift with a card saying they hope their gift will inspire me for my blog. It did! They gave me a set of special pans to make fluted taco or tortilla bowls! You put the soft taco or tortilla into them and bake and you get a free-standing bowl to fill with your ingredients. I enjoy Mexican food but I wanted to start with something different. What else could be shaped into these cool bowls? Phyllo dough! Follow the directions on the package for using the phyllo dough. It is necessary to defrost frozen phyllo dough in the refrigerator for about 7 hours and then bring it to room temperature which takes 1-2 hours. The unused dough can be re-frozen. I used eight sheets of phyllo dough. 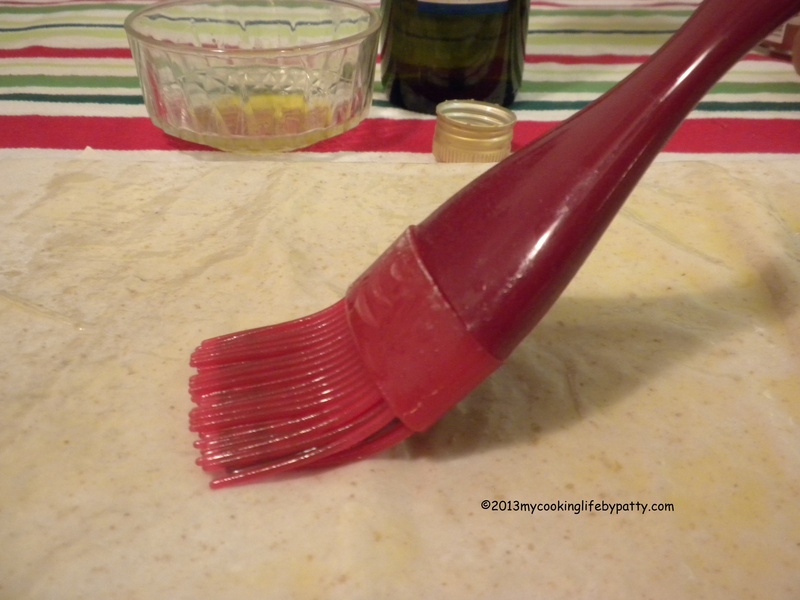 Phyllo dough is thin as paper and dries out fast. Once you have gotten your sheets out, keep them covered with wax paper and work fast. You’ll need at least eight layers in each pan to make a bowl that can stand up to being filled. If you don’t have special taco bowl pans, you can use individual pie pans, ramekins, oven-safe soup bowls, tart pans or even a muffin tin. You may need to do a little more shaping to get the bowl looking the way you want it to. I used the back of a baking sheet to work with the large sheets of phyllo. I oiled the surface of the sheet with olive oil and folded it in half, then oiled the exposed surface and folded in half again. That made four layers. 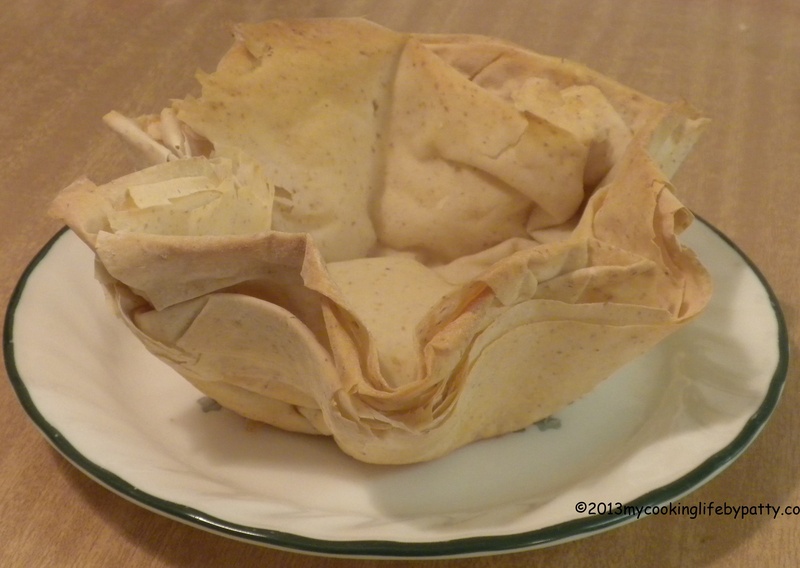 I repeated the process so I had two sheets–eight layers in all–for each bowl. Tuck the edges under to help shape them. Once you’ve got your pans layered, bake them (unfilled) as directed on the package. Mine baked at 350 degrees for 15 minutes. They are done when they are firm and lightly browned. Let them cool completely before carefully removing them–they are delicate! Wash the cucumbers and tomatoes. I don’t peel my organic cucumbers. I do like to remove the seeds for this dish, because I don’t want the extra liquid making my phyllo bowl soggy. To do this, slice the cucumber in half the long way and use a spoon to scoop out the seeds. To remove the tomato seeds, cut the tomato in quarters and use your fingers to gently push out the seeds and extra liquid. Dice the cucumbers, tomatoes and onions. Chop up some olives. Drain the beans. Slice the lemon rinds. If you don’t have these, check out how to make them and you’ll have them for next time. For this time, use a bit of lemon zest instead. Wash and dry the lettuce and break into bite-size pieces. If you are making this with small bowls such as an individual muffin cup, break the lettuce very small or shred it. Set the lettuce aside. Wash the mint leaves and remove the stems. Pile the leaves on top of each other and roll them up lengthwise. Use a sharp knife to thinly slice the roll and you get a nice pile of thin slivers of mint. This method is called “chiffonade.” and is also useful for slicing things like basil leaves. If you used parsley instead, just wash it and give it a rough chop. Crumble your feta cheese. Mix the cucumbers, onions, tomatoes, beans, olives, feta, mint and preserved lemon rind or lemon zest together (Not the lettuce). Dress the mix with a simple combination of 3 tablespoons of olive oil, 1 tablespoon lemon juice, 1-2 crushed garlic cloves, salt and pepper to taste. Toss the salad. Plate your phyllo bowls. Fill the bowls 1/3 full with lettuce, then pile the dressed salad mix on top. Garnish with mint leaves and a little extra feta. Obviously there is an infinite variety of ingredients for this kind of dish! Our thoughts wandered way, way off track toward ice cream with espresso or dark chocolate balsamic vinegar on top. What combination would you like to try? 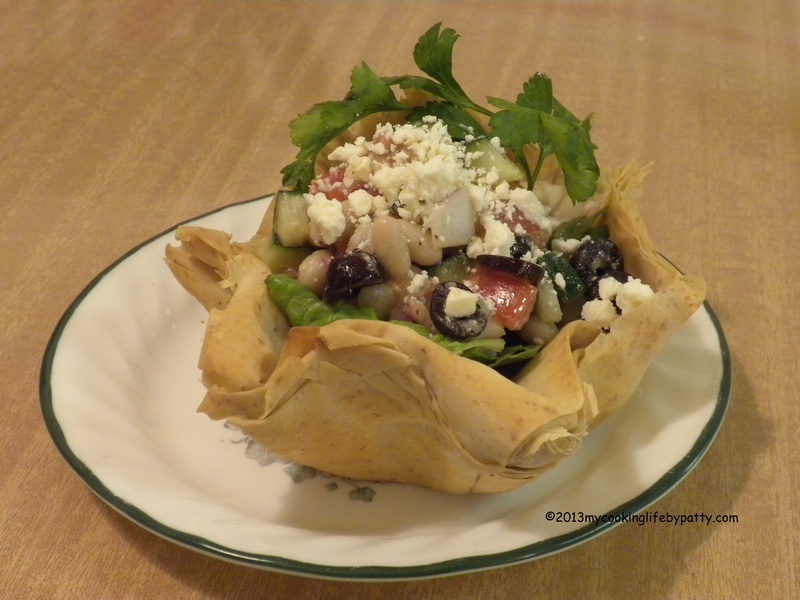 This entry was posted in Cooking, Recipes and tagged chiffonade, cooking, feta cheese, Greek salad, Kalamata olives, phyllo dough, preserved lemons, Recipes, taco salad by mycookinglifebypatty. Bookmark the permalink. HELLO! Wow! This sounds and looks so good, Patty! I love this! Thanks, Amy. The phyllo crust with the tangy salad in it was . . . well, we scarfed it up right away! I knew these pans would come to a better fate than mere meat, bean, cheese and rice tacos!!! They have been upgraded to Classical style! Thanks Nick for sending them to me. I’ve got some more ideas for them too! What fun. And now I really want to crunch into one of those flaky babies! They were very flaky and light!